If you can't tell, I have summertime hot dog fever! One of my buddies bought a hot dog joint my senior year of college. I would often work the grill and counter, ad-libbing insane hot dog creations in my spare time. Don't get me wrong...I love hot dogs. But I love hot dogs with exorbitant amounts of condiments even more! 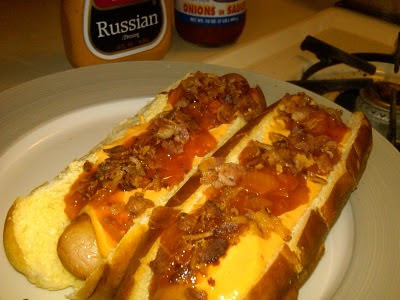 Give the bun and dog a healthy coating of Russian dressing, carefully layer the maximum amount of Sabrett Onions possible before structural failure and sprinkle the crumbled bacon on top. Eat and repeat. Note: Be real and fry the crumbled bacon yourself...bacon bits are ridiculous. If you're feeling saucy, you can also use this homemade Russian dressing recipe.